a special product with a new axial geometry and an excellent smooth surface. This new profile, combined with very low axial and radial run out, engraved on every single blade, enables exceptionally clean cuts and the best cutting performance together with a long knife life. Our blades are designed for high speeds up to 300 strokes per minute. Our log saw blades are designed to cut toilet paper, kitchen paper, and many more tissue items. These knives can be used on the following tissue saw machines: Fabio Perini, PCMC, Gambini, Futura, MTC, United Converting, Maflex, MTorres Tissue, Bretting, BaoSuo, Italconverting, Kawanoe Zoki, Dechangyu, Zambak Kagit. 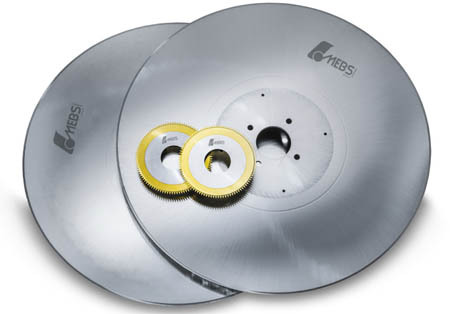 MEBS can also offer the correct grinding wheels for all types of machines to grind our high hardness knives.